How does the household economy evolve in relationship to the changes in the family structure / size (neolocality, asset management)? To what extent are households dependant on the market (labour) and to what extent do they use the market to manage their property (assets)? To what extent a﻿﻿re households dependant on their family / parents? To what extent can households decide by themselves on their course (agency of households)? How did households in the fifteenth and sixteenth centuries cope with risks? Did households use risk-spreading techniques (scattering holdings), store their wealth (hoarding), or create diversified portfolios in this setting, or did they use the capital markets to secure surplus income? What main developments would households in the fifteenth and sixteenth centuries have reacted to? How would price movements have affected people in the fifteenth and sixteenth centuries? How did people in the fifteenth and sixteenth centuries manage to build a financial portfolio that was stress-resistant? Which combinations of assets show a negative correlation to risk? Is the casestudy of Edam (see beneath) exemplary or exceptional for the county of Holland (fifteenth-sixteenth centuries)? Low Countries, fifteenth and sixteenth centuries. Tax assessment of 1514: Informacie up den staet faculteyt ende gelegenheyt van de steden ende dorpen van Hollant ende Vrieslant om daernae te reguleren de nyeuwe schiltaele. Gedaen in den jaere MDXIV . Published by R. Fruin on behalf of de Maatschappij der Nederlandsche Letterkunde (Leiden, A.W. Sijthoff, 1866). Available online here. Tax assessment of 1494: Enqueste ende informatie upt stuck van der reductie ende reformatie van den schiltaelen, voertijts getaxeert ende gestelt geweest over de landen van Hollant ende Vrieslant. Gedaen in den jaere MCCCCXCIIII . Published by R. Fruin on behalf of de Maatschappij der Nederlandsche Letterkunde (Leiden, E.J. Brill, 1876). Available online here. Datasets based on the results of our research activities will in due time be published on this website. ZUIJDERDUIJN, C.J., VAN ZANDEN, J.L., and DE MOOR, T., 2012. "Small is beautiful"; on the efficiency of credit markets in late medieval Holland. 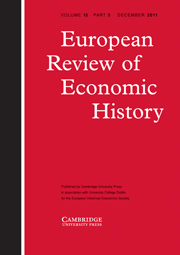 European Review of Economic History , 16 (1), 3-22. Available in PDF here. ZUIJDERDUIJN, Jaco and DE MOOR, Tine, 2011. Spending, saving, or investing? Risk management in sixteenth century Dutch households. Accepted for publication in The Economic History Review . Available in PDF here. DE MOOR, Tine, VAN ZANDEN, Jan Luiten, and ZUIJDERDUIJN, Jaco, 2009. Micro-credit in late medieval Waterland; households and the efficiency of capital markets in Edam en De Zeevang, 1462 - 1563. In: La famiglia nell'economia Europea secc. XIII-XVIII; The economic role of the family in the European economy from the 13th to the 18th centuries , ed. Simonetta Cavachiocci, 651-68. Firenze: Firenze University Press. Available in PDF here.